Lilianatha: Amber, darling where are you?? Come out, come out wherever you are... That girl! She must be chasing the spirits, again. Ah well, I shall not wait for her any longer. I pretty sure you want to know all the Shidou Hikaru. Now where should I start? Spirits: How about your opinion, divine and august Lady. Lilianatha: Why, thank you. By the way, do you know where Amber is? Lilianatha: I do hope she is not annoying you. Spirits: No, no, divine Lady, not at all(yeah right. )Please start telling us about Hikaru. Lilianatha: I should be doing that. 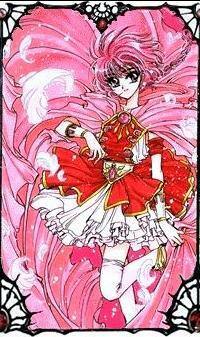 Well, in my opinion, Hikaru is a wonderful knight. She is one of a kind person. Indeed you do not find many that is as innocent as she. Nor can you find many with her sense of honor, friendship and courage. When Larfarga was battling her in the Holy Shrine, her main concern had always been her friend. Even when her own life was at stake she kept on worrying about her friends' safety, not her own. Lilianatha: Like her name, "light of the lion shrine", she had always been the light that lit the way. Hikaru also has the courage of a lion. She would not back down. She also has knack for communicating with animals, such as Mokana. Though we later found out that Mokana only communicated with Hikaru because she was a likely candidate for pillarship. Oh, 'tis a sad thing. Lilianatha: Amber, such shocking behavior! Stop or I'll do worse things to you than locking you up in a closet. Did you know you just interupted a wonderful discussion about Shidou-san? Amber: Ha! Who cares about that little red-head? (snicker) She's sooooooo useless. Lilianatha: Whack! Smack! Slap! Get back into that closet and don't come out until I tell you to. (hear the spirits cheer!) I am sincerly sorry for that interruption. Now I don't remember where I left off. Oh yes, something about Mokana and the pillarship. Let's not dwell on the sad moment. Hikaru is one of the shortest member of the knights. Yes, in fact Umi mistook her to be a 4th grader. Even though the fire knight is vertically challenged she still can jump up very high. Plus the fact that she has a smile for everyone makes up for her height. 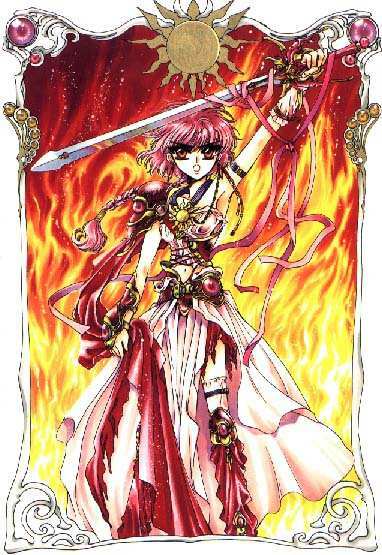 Inside Hikaru is a brilliant flame that will never dim. Whenever there is a cloudy day, Hikaru and her smile will cheer you up. Lilianatha: Oh, we're out of time. Too bad. I'll come back next time. Lilianatha: Ciao! Sayonara! Valve and valvete! Bye!!!!!!! Do you have comments or suggestions? Do wish to compliment us? Use the new-fangled idea of email!! Visit the Web of Dreams for fantastic backgounds, buttons, etc. Go visit!! This page is created on May 21, 1999 by the Lady of the Garden a.k.a. Chieri. Do not take anything from this page. If you do, I'll find you and you will pay pay pay pay!!!MWHAAHAHAHAAAA!! !